NOHFC Ontario Business Grants and Loans Eligibility | Mentor Works Ltd. The Northern Ontario Heritage Fund Corporation (NOHFC) is a federal government organization that administers funding programs for growing businesses. As one of Canada’s six regional development agencies (RDAs), NOHFC has the mandate of developing incentives that help businesses and municipalities alike. Its programs help attract wealth to Northern Ontario while helping businesses improve their competitiveness. Through NOHFC grants and loans, Northern Ontario companies can reduce eligible project expenses by up to 50% or more. To qualify for NOHFC’s Ontario government funding programs, businesses must meet the specifications of a given funding stream. Each NOHFC funding program offers slightly different eligibility criteria, which makes application planning a highly-effective way to improve your likelihood of funding success. Continue reading this blog to learn more about how to qualify for NOHFC’s business funding streams. What Business Funding Programs Does NOHFC Offer? While there are multiple streams of government funding offered by the Northern Ontario Heritage Fund Corporation (NOHFC), there are three main incentives delivered to businesses. Other streams (not listed here) are a good fit for non-profit organizations but do not provide support for business applicants. The Northern Business Opportunity Program: Focuses on business expansion and investment projects that lead to new jobs and economic activity in Northern Ontario. Northern Innovation Program: Focuses on research and development projects that have a sustained benefit to businesses operating in Northern Ontario. Northern Ontario Internship Program: Focuses on the hiring of a recent post-secondary graduate and providing relevant work experience in their field of study. These programs each have multiple streams of support. Funding amounts depend on the project stream chosen, and eligible project expenses that are incurred. For more information on the purpose and funding potential of each NOHFC stream, please read Mentor Works’ NOHFC overview blog. If your business operates in one of the above sectors, use the following tables to explore each stream of NOHFC’s incentives and learn if they’re a good fit for your upcoming projects. New Investment Projects Competitive, profitable businesses not currently located in Northern Ontario. All new business investments in Northern Ontario, given the company does not have current operations and will be creating new jobs in the province. Small Business Startup Projects For-profit in NOHFC’s target sectors. New or used equipment purchases, third-party training, information and communications technology (ICT) costs including software, and leasehold improvements. Business Expansion Projects For-profit in NOHFC’s target sectors. Capital investments including construction and new or used equipment purchases. Software and training costs may also be included. Film & Television Industry Projects Canadian-owned and controlled corporations owning all project production rights. Must have the commitment of a distributor or broadcaster. All costs, including labour, that are incurred in Ontario. Applied Technology Research & Development Projects For-profit companies, either independent or part of a post-secondary research collaboration. Internal labour costs, prototyping, testing, and intellectual property (IP) protection. Opportunity Assessment Projects For-profit companies researching, developing, or commercializing new technologies in collaboration with a not-for-profit research institution. Fee-for-service costs charged by the research institution, including technical, market, and financial feasibility studies, and the development of commercialization strategies. Pilot Demonstration & Commercialization Projects For-profit companies, either independent or part of a collaboration with research institutions. Project-related labour costs, building construction or renovations, demonstration prototype costs, product certification, and trade show marketing costs. Public, private, and non-profit organizations within NOHFC’s target sectors. The salary of a recent graduate being employed full-time. To learn more about each program, including the amount of funding your organization may be able to receive, please access Mentor Works’ NOHFC program overview blog. While each NOHFC program has a slightly different application process, most programs require an eight- to 10-page critical review of the project with additional budget and financial details. High-priority projects display the potential to bring economic prosperity to Northern Ontario through investment and the creation/maintenance of high-value jobs. To discuss your eligibility for NOHFC grants and loans and explore your options for navigating the government funding process, please contact Mentor Works. I own a private practice rehab company and I am looking at expanding the services we provide. I would love some information about the possibility of accessing these funds for several areas of expansion including training, technology, materials and equipment and well as new hires and recruitment. It’s in Northwestern Ontario and services that our area are really lacking at this point. Would love to connect! Hi Liz, thanks for your comment! Eligibility for these government programs is based on your company and project both being a good fit for funding. I’ve asked one of my colleagues to reach out to you to discuss your funding potential; please allow 1-2 business days and they will contact you by email. Hi, we own a small/medium size windshield replacement/ flat glass/ plastics business in northern Ontario. We are looking at doing some expansion’s and renovations to the building. We are wondering if we would be eligible for funding to help do this. We are quiet confident if we expanded the building we could expand our business. We would be really interested in hearing from you on this matter. Hi Susan, thanks for your comment. Expansion projects typically carry potential for government funding support, but it depends on your company’s specific eligibility factors and expansion project budget. I’d advise you to reach out for personalized support through our contact form, or register for an upcoming government funding webinar to learn more. I run a boutique social media and writing agency in Toronto. I have a small team of professionals and we have been in business just under 5 years, serving a diverse array of local small to medium sized businesses. Business is steadily growing, but we’re at capacity in terms of the work load we can handle without bringing on additional expertise/help. We could also really use some help subsidizing new equipment. Is this something that might qualify for a small business grant? Hi Megan, thanks for your comment. Expansion and technology adoption projects typically carry potential for government funding support, but it depends on your company’s specific eligibility factors and project budget. I’d advise you to reach out for personalized support through our contact form, or register for an upcoming government funding webinar to learn more. Hi I currently have a small business with one employee supplying granite and quartz countertops in North bay and I’m looking to establish a division of furniture made from live edge rustic fallen trees, looking for ideas to be able to purchase equipment for slabbing large trees and equipment for drying ex kiln as well as machinery I already have property to start on where and who would I be able to inquire funding? Hi Paul, thanks for your question. 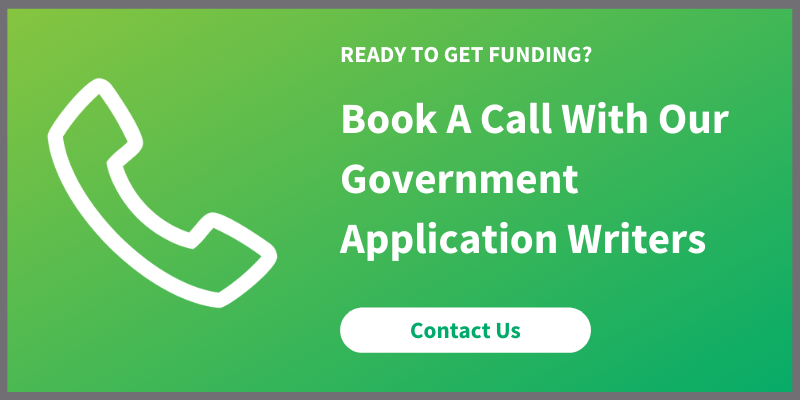 Eligibility for government funding programs is usually determined by a few factors, including project eligibility and your business’ eligibility. While your project sounds like it has potential for funding, your business may be considered to small or early-stage to access funding, depending on the program that aligns best with your upcoming project. The best way to identify specific programs you may be eligible for is by contacting us. Fill out our contact form and one of our Government Funding Planners will respond to you directly in 1-2 business days!